I know some of you will be saying that I am too late with this topic. New Year’s resolutions? Those are the drunken promises we make to ourselves in that mad week between Christmas Eve and New Year’s Eve – we start them along with our hangovers on New Year’s Day and by now, we have fallen off the wagon already and are promising to try again next year. Is that you? Or are you still doggedly persisting with yours.? 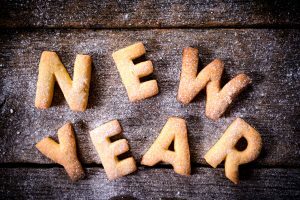 Personally I never start my New Year’s Resolutions until the children are back at school in January – before then is still Christmas holidays and there is no point in making myself promises which will almost certainly be broken. So for me the New Year push began today – I went to the gym and spent some time tidying my house and putting my business in order. So far so good – 1 day down. Please comment below and let me know how you are getting on with yours. One of the main reasons that New Year’s resolutions fail is simply because you are not totally committed to them. Many people make so many resolutions that it is simply impossible to know where to start. So instead of taking action it is much easier to give up on all of them. The best way to get around this issue is to find just one thing that you truly want to achieve with all of your heart. This might be to lose 50 pounds to save £1,000 or to take up a new hobby. Then focus on it with all your strength – and don’t start to loook at resolution number 2 until your habits for the first resolution are completely ingrained. Another way to increase success with your New Year’s resolution is to shift your perspective of it. Resolutions are viewed as wishes and dreams by many people, and this is another reason why people aren’t successful with them. Instead you want to think of your resolution as a life goal. Goals are more often specific things and desires that you want to achieve. When you tell people what your goal is they are more likely to be supportive. When you say that you just made a New Year’s Resolution they often assume that once February hits your resolution will have gone. So, be very specific with your resolution and make it based on one thing. This way you will find it much easier to stay on track and achieve your goal. If you goal is a large one that includes a lifestyle change then break it down into monthly, weekly and even daily goals. By achieving a smaller goal each day, you are less likely to lose your focus and you will be able to see that you are making progress. Let’s look at an example here. Say you want to lose 50 pounds by next Christmas and make this your New Year’s resolution. If you leave it at that and start working on losing weight in January things are great. What happens, though, is that you don’t lose weight fast enough, and by February you have only lost 5 pounds. Your immediate reaction is to give up because at that rate you won’t reach your goal by the end of December. You are not alone if you think like this, many people do and many people give up because the target seems so big and so far away. Break up the 50 pounds into a yearly goal by setting a weekly goal to lose 1 pound. This is much more realistic and attainable. The chances are that you will have weeks where you lose more than 1 pound and this can help spur you on. Plus it offers you a safety guard for those weeks when you don’t lose any weight. You must always remember that it is okay to get off track a little and not meet your weekly goal. For instance you may not lose weight but you may be exercising more and feeling great. Think about how one balances out the other, you are feeling great this is a positive. While not losing pounds is not want you want you are still working on improving your lifestyle, which is another plus! This New Year’s try defining your resolution as a goal instead. Give yourself a time when you want to achieve it and tell your family and friends what your goal is. You will find that they are more supportive than you may have thought. Would you like to be more successful at setting goals, tracking them and following them through? Take a look at my Goals and Resolutions ebook and tracking system. I’m using it for my own goals this year, and I intend to smash them all! The more you write and rewrite your goals and think about them, the clearer the goals will become. The clearer you are about what you want, the more likely you are to do more and more of the things that are consistent with achieving it. Meanwhile, you will do fewer and fewer of the things that don’t help to get the things you really want. I specialise in helping my clients reach their goals through the use of hypnosis and NLP. With weight for example I work with my clients in a very different way. I don’t get them to look at the big picture as it is often too overwhelming. I certainly don’t give them a goal weight. Instead I look at changing their lifestyle and getting them to recognise when they are hungry and when they are full (signals which are often ignored). When they have successfully mastered this the weight will start to come off at its own pace. I find this much more effective than insisting my clients lose a certain amount per week. Sadly diets created feelings of deprivation and that is why they don’t work that well.